Jerry Bradley sits a foot away from me, in an old waiting room chair from the RCA Records building on Music Row in Nashville. It’s one of hundreds of objects he refers to as “good junk” in his Mt. Juliet man cave. Like a Grandfather whose stories captivate even a kid with the attention span of a house fly – Mr. Bradley serves up tale after tale that leaves you wanting more and more. 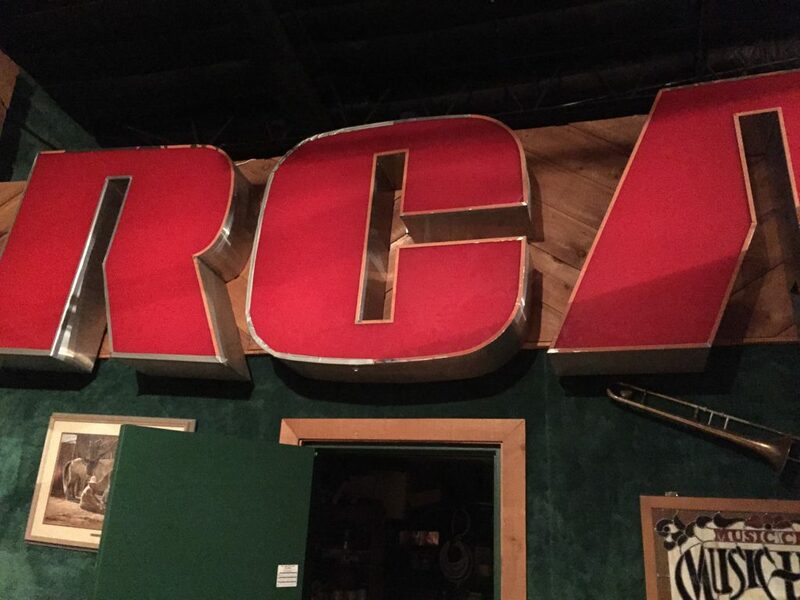 The original RCA signage that once appeared on the front of the RCA Nashville building when Jerry Bradley was President of RCA Records. He tells the story of signing a little known group called Alabama. At the time they were on a tiny label and nobody in Nashville wanted them. Bradley, wanting a group as part of his label’s catalog of artists – signed them anyway. The group became one of the biggest selling bands in music history with over 75 million albums sold and more than 40 number one hit songs. Each piece of “junk” in the former Bradley Barn has an incredible story behind it. A black and white autographed photo of what appears to be astronauts on the moon is sitting on the floor propped up against the wall. 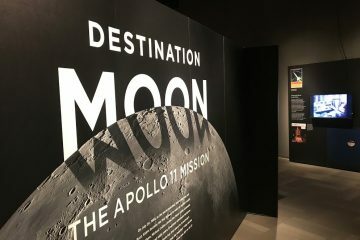 Mr. Bradley tells me how he produced a cassette for the guys that went to the moon so they’d have something to listen to on their trip. 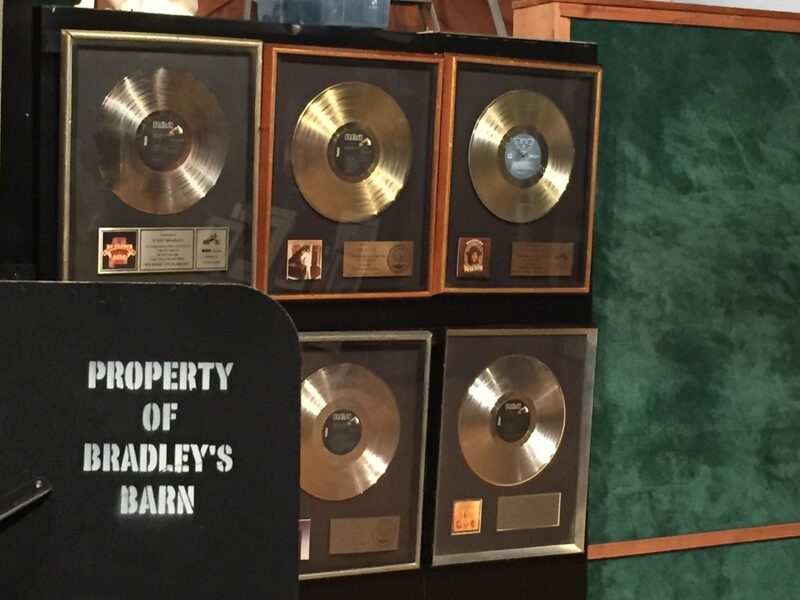 A wall of gold records indicates how many songs and artists have been influenced by Jerry Bradley and his father, also a famous music producer, Owen Bradley. The first one to catch my eye was a gold record for Wanted! The Outlaws – an album known to insiders as a monumental production that in many ways, changed the music business. 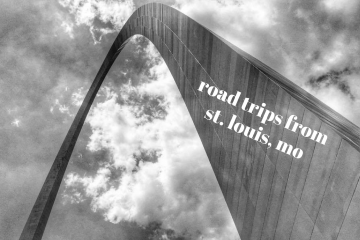 Mr. Bradley shares stories (and headaches) of getting together the artists – Willie Nelson, Waylon Jennings, Jessi Colter and Tompall Glasser to get the album produced. Of course, Mr. Glasser came running into Bradley’s office with the signed contract. A photo of what Bradley’s Barn looked like before catching fire in 1982. Some of the biggest names in music recorded here including Conway Twitty, Burl Ives and Dolly Parton. The property where the Bradley Barn was once located is absolutely beautiful and peaceful – surrounded by nothing but trees and fresh air. It’s no wonder so many artists wanted to escape the bright lights of Nashville and come here to record their songs. Conway Twitty, Loretta Lynn, Kitty Wells, Dolly Parton, Dinah Shore, Burl Ives and so many others came here to sing and cement their place in music history. Mr. Bradley talks about his Dad who taught him everything he needed to know to be a success in the entertainment business. 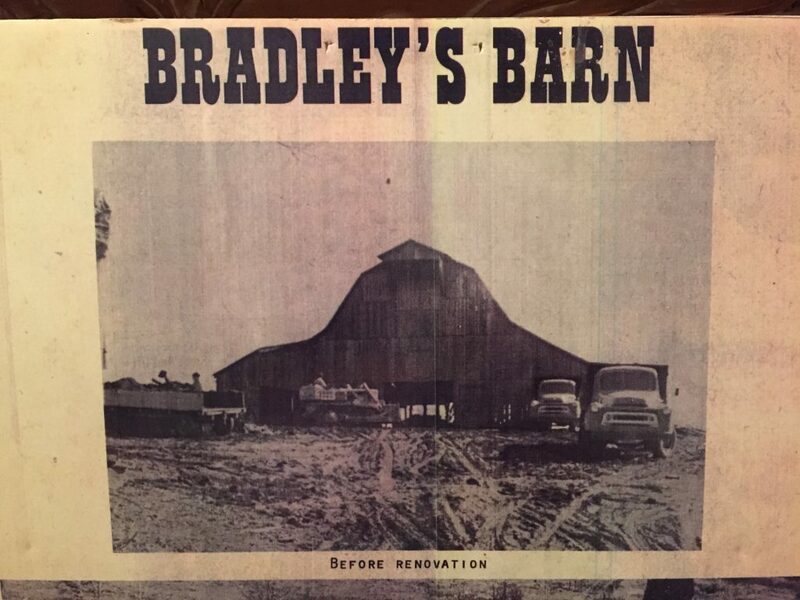 A wire in a fluorescent light started a fire that would burn Bradley Barn down in 1982 on his Dad’s 65th birthday. 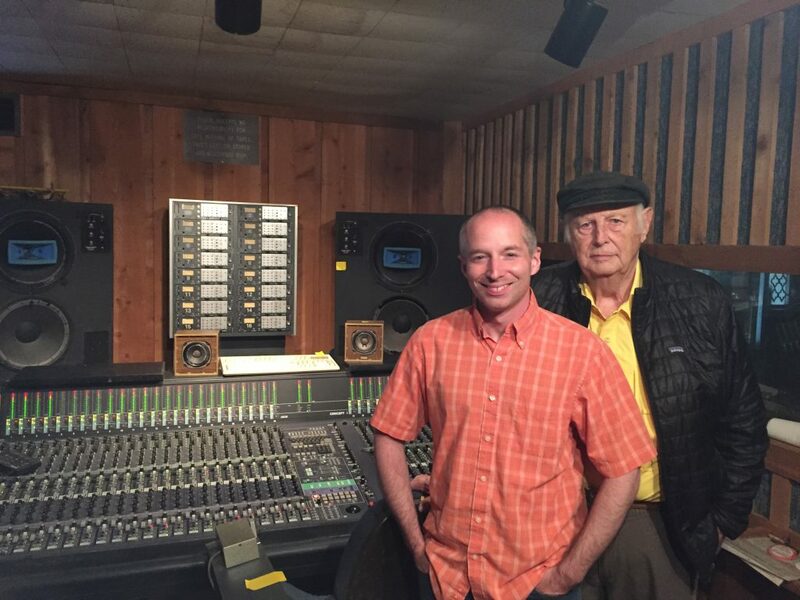 Standing with Mr. Jerry Bradley in front of a recording console that helped produce many well known country songs and albums. The console is set to be donated to Wilson County, TN for a museum exhibit. As we wrapped up our radio interview, Jerry points at my recorder and says “You’ll want to get this one on tape” and proceeds to tell me another great story. He talks about the day Waylon Jennings brought him three songs and he hated all of them. “You don’t look interested” exclaimed Jennings. He concurred that he wasn’t thrilled even though they’d probably still sell a couple hundred thousand copies. At that point, Jennings stood up and sang what would become one of the most well known country music songs of all time. That was the birth of a tune called “Mama’s Don’t Let Your Babies Grow Up To Be Cowboys”.